I met Tom Johnson while visiting the grounds of the Mt. Auburn Cemetery in Cambridge. Tom is the Family Services Director for the cemetery and has worked there for seven years. He says that in his job he coordinates services for families and events and loves his job. Prior to working at Mt. Auburn, Tom worked in the funeral industry and for the airlines. 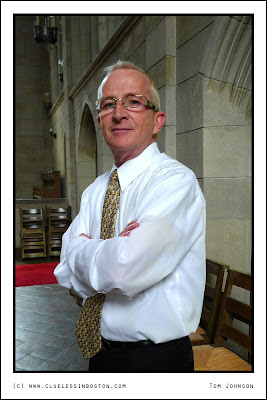 Tom is shown here in the Gothic Revival Bigelow Chapel. He was happy to talk about the cemetery, its magnificent grounds, and the Bigelow Chapel. The Chapel for instance, just finished a 2.5 million dollar restoration of its stained glass windows. I'll have a picture of part of the stained glass tomorrow. He also told me that Mt. Auburn Cemetery is the second largest flyway for birds in North America, definitely a place to visit if you like birding. Thanks for the compliment! It's inspiring to see blogs like yours that keep a rigorous update schedule (something I need to work on). I noticed the M8 was in your wishlist - I actually sold one in favor of an LX3/Dlux4. You're not missing much - the image quality leaves too much to be desired for a camera of that cost. Also, I love your "search by category" widget. How'd you do it? I like Tom Johnson's spirit as you've presented it. You've captured something a little defiant, but also kind. Great portrait of an interesting man. People who work in funeral industry are often shown as sad and serious. Tom seems happy and sympathic. You made a great potraitt, both by picture and words. Thanks for so interesting post! He looks be very kind! A very good portrait, both in post and photo. Wow, what an interesting story behind the shot! Another good portrait and interesting story.